WARNING: It is not recommended to run this on production CDOT clusters since it can generate substantial CPU load whilst it is running! Note: Tabs have been removed to display the script better in blogger. 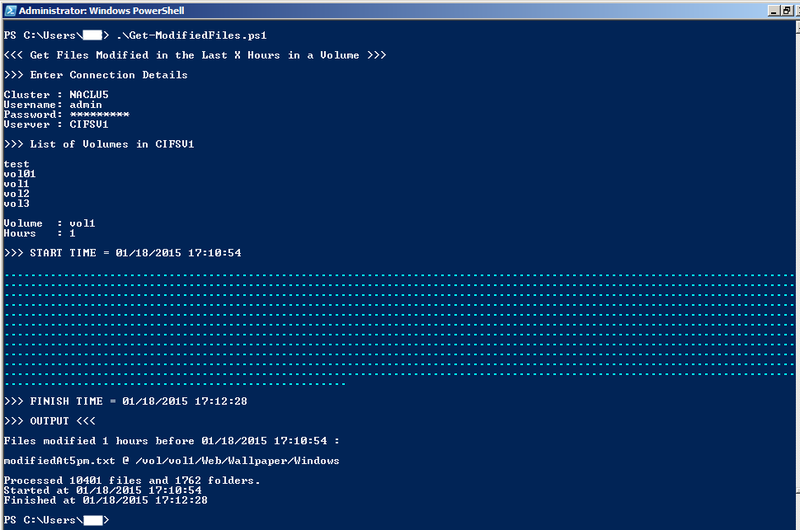 # A program to find the files modified in a specific NetApp Clustered ONTAP Volume, in the last X hours! "";"<<< Get Files Modified in the Last X Hours in a Volume >>>";""
">>> Enter Connection Details ";""
">>> List of Volumes in $Vserver ";""
">>> START TIME = $StartDate";""
"";"";">>> FINISH TIME = $FinishDate";""
"Files modified $Hours hours before $StartDate :";""
"";"Processed " + $Global:FileCount + " files and " + $Global:FolderCount + " folders." $Date = Get-Date -uformat "%Y%m%d%H%M"
$OutputFile = $UsersProfilePath + "\ModifiedFiles_" + $Cluster + "_" + $Vserver + "_" + $date + ".txt"
This is great! I do have a question though- which would cause a greater load: this script doing a recursive read-ncdirectory, or a similar script doing a get-childitem? I'd think get-childitem would cause greater load since you've got to go over CIFS. There's advantages to using APIs direct to the fileserver. Thanks, VC! That was my feeling as well. And thank you for the link to your updated script... It's really clean!